April 2019 is Suffolk Libraries Children’s Month. We’re helping parents and children find new favourites with a list of authors and illustrators we think should be more well-known. This US author-illustrator has recently been shortlisted for the CILIP Kate Greenaway Medal for The Wolf, the Duck and the Mouse . Why not also try his Shapes trilogy, illustrated by Jon Klassen: Circle , Square and Triangle . This Swedish illustrator and graphic designer is the creator of the increasingly popular ‘Where’s Mr/Mrs…?’ series, including Where’s Mr Unicorn? and Where’s Mrs Ladybird? . She has also authored non-fiction titles such as My First Book of London . Author-illustrator Beth Woollvin specialises in dark and wittily subversive retellings of classic fairy tales including Hansel & Gretel , Rapunzel and Little Red (winner of the 2014 Macmillan Prize for Illustration). This German author/illustrator is the creator of the Little Rabbit series, which looks as activities such as bedtime and bath time with gentle humour and warmth: Tickle My Ears , Bathtime for Little Rabbit and Poor Little Rabbit! Also from Germany, Britta Teckentrup is internationally acclaimed and award-winning, and deserves far more attention in the UK. Her stunning books include Under the Same Sky and Birds and their Feathers and (with Patricia Hegarty) Moon and The Sea . And co-creator of Sophie Johnson: Unicorn Expert and Sophie Johnson: Detective Genius with Ella K. Okstad. Author of two lovely books so far: There’s a Tiger in the Garden and Juniper Jupiter . Winner of the 2018 Waterstones Children’s Illustrated Book Prize 2018 for The Secret of Black Rock , his other beauties include Arthur and the Golden Rope and Marcy and the Riddle of the Sphinx . Creator of the Amelia Fang books, most recently Amelia Fang and the Half-Moon Holiday , Anderson also writes comic strips for The Phoenix and has published standalone comic books such as Evil Emperor Penguin (Almost) Takes Over the World . We’re looking forward to her forthcoming picture book, I Don’t Want to be Small . Skinner’s first book, Bloom has some excellent reviews so far. The author of the Carnegie Medal shortlisted The House with Chicken Legs is publishing her second book, The Girl Who Speaks Bear , in September, and we can’t wait. 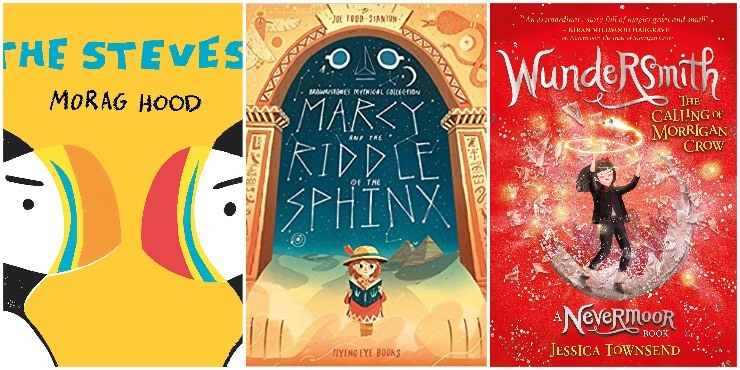 This author’s debut, The Train to Impossible Places: a cursed delivery has been shortlisted for the 2019 Waterstones Children’s Book Prize and is on the reading list for this year’s Summer Reading Challenge, Space Race. We’re excited for the other two books in the series! This Australian author’s debut Nevermoor: the trials of Morrigan Crow won the 2018 Waterstones Book Prize and is set to be released as a film later this year. We also love the sequel, Wundersmith: the calling of Morrigan Crow .